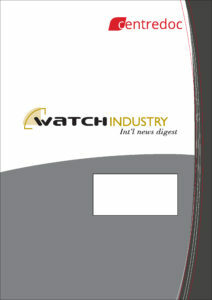 Watch Industry Int’l News Digest is the world’s first Business Intelligence service aimed at watchmaking industry managers. Fed by a powerful web search engine, Watch Industry Int’l News Digest provides decision-makers on a weekly basis with strategic information on the market, watchmaking brands and technologies. Who has changed position in the key brands of the watchmaking industry? Which brand has been take over by which investor or group? How have the results of the big groups progressed on the stock market? What are the development prospects of the watchmaking industry in China, Hong Kong, Korea, Japan, but also the United States and the United Kingdom? Watch Industry Int’l News Digest gives you the answers! Through its weekly monitoring, CENTREDOC identifies all the important press articles, verifies the various sources and offers the reader a summary of the strategic information. This service also provides our clients with a database containing the entire monitoring history since 2001.